One of the nation's most powerful labor unions is rallying supporters to oppose Brett Kavanaugh, President Trump's nominee to replace Anthony Kennedy on the Supreme Court. On Friday, Service Employees International Union (SEIU) began circulating a petition online for its allies to send to their home state lawmakers. The union letter calls Kavanaugh a "narrow-minded extremist" and accuses the D.C. Circuit Court judge of undermining workers' rights and opposing abortion. "Kavanaugh is a narrow-minded extremist who will chip away at our rights in the workplace, the doctor's office and the ballot box," the letter says. "If Kavanaugh is confirmed he could decide to take away the things that our families hold dear: healthcare, voting rights, union rights, women's reproductive health, human rights for immigrants, LGBTQ rights, clean air to breathe, and clean water to drink." SEIU is one of the largest public sector labor agencies in the country boasting nearly 2 million members, but it could see those numbers dwindle after the Supreme Court declared forced unionism in government agencies unconstitutional in June. The Court ruled 5-4 in Janus v. AFSCME that agencies could not force public sector workers to pay union dues or agency fees as a condition of employment. The union had more than 100,000 agency fee payers—about 5 percent of all workers represented by SEIU—in 2017, according to federal labor records. Those workers now have the ability to sever ties completely. The ruling has also opened the door to a number of class action suits, including several aimed at SEIU or its local and state affiliates, from workers looking to recover the millions of dollars they paid in fees over the years. "Judge Kavanaugh has repeatedly sided with greedy corporations over working people," the union said. "If confirmed, he'll have a massive impact on workers' rights for generations. America needs a Supreme Court justice who understands that everyone is created equal." SEIU is not the only labor organization that has vowed to to block Kavanaugh's nomination. AFL-CIO, the nation's largest union, has also rallied its members to oppose President Trump's second Supreme Court appointment. In July it staged a call-in day to Democratic and Republican senators charged with confirming the 53-year-old judge to a lifetime appointment. AFL-CIO President Richard Trumka called Kavanaugh "deeply troubling." "Any senator who believes Supreme Court justices should protect the rights of all Americans should reject this nomination and demand a nominee who will protect the rights of working people and uphold our constitutional values of liberty, equality and justice for all," Trumka said in July. "Across the country, working people are organizing and taking collective action as we haven’t seen in years, and we won't stand for any politician who supports justices who put our rights at risk." SEIU did not return request for comment. 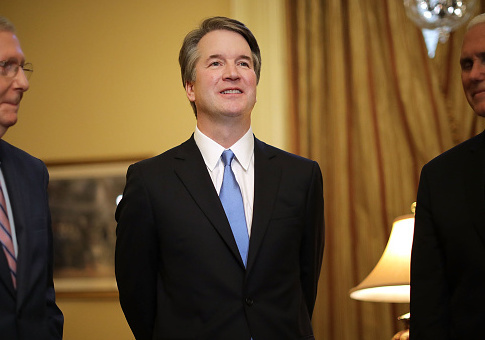 Kavanaugh has received strong support from conservative judicial activists, who have launched an aggressive campaign to confirm him to the bench. The Judicial Crisis Network, which has spent millions of dollars on television ads to woo vulnerable Democratic senators in traditionally Republican states to support Trump's nominations, called Kavanaugh a "mainstream nominee" in a statement. The group's chief counsel, Carrie Severino, accused liberal groups of attempting to obstruct the nomination. "Judge Kavanaugh has been endorsed by leading figures on the right and the left. He is a mainstream nominee who will base his decisions on the aw and the Constitution," Severino said in a statement. This entry was posted in Issues and tagged Brett Kavanaugh, SEIU, Unions. Bookmark the permalink.